Phew. That’s one long title. Allow me to explain. As you know, my day job keeps me busy over at Ladies’ Home Journal. 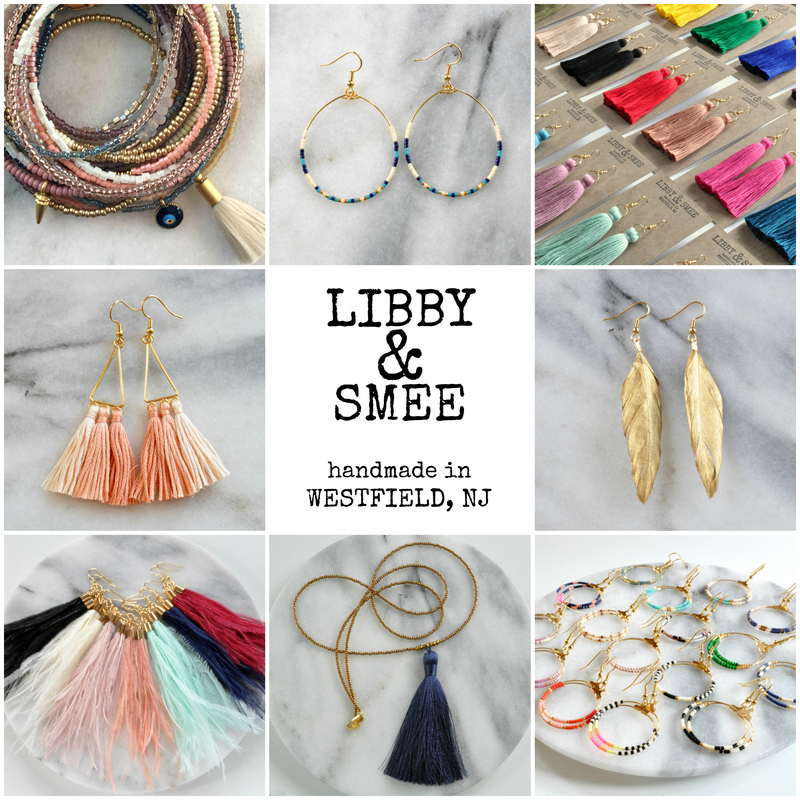 I do lots of fashion stuff and not a lot of crafting stuff. 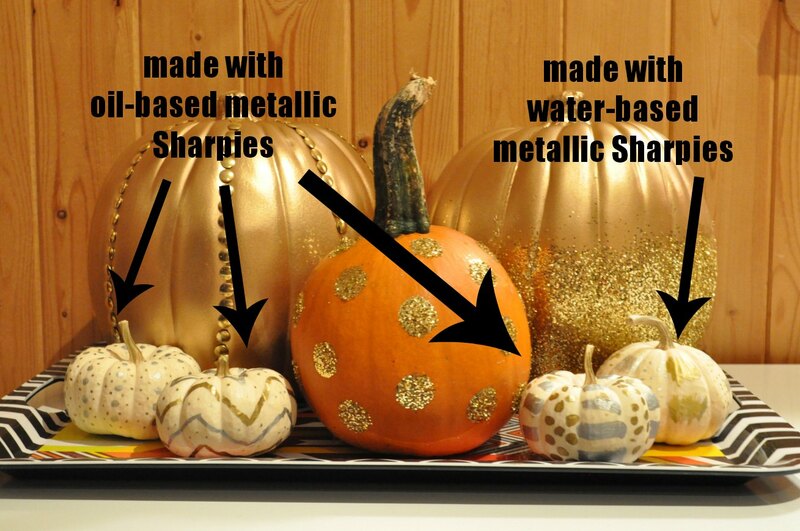 But since I love me some glitter and spray paint, I was asked to present several of the Halloween crafts we featured in our October issue (all originally seen on some of our favorite blogs) on The Better Show, a nationally syndicated lifestyle program owned by Meredith, LHJ’s parent company. So, to put it in simpler words: I’m here to show the crafts that I made for The Better Show which were featured in Ladies’ Home Journal and originally produced by bloggers like me. Does that make more sense? No? Well, then just set the DVR because I’ll be on Better tomorrow, Tuesday, October 29th. OK? Thanks. 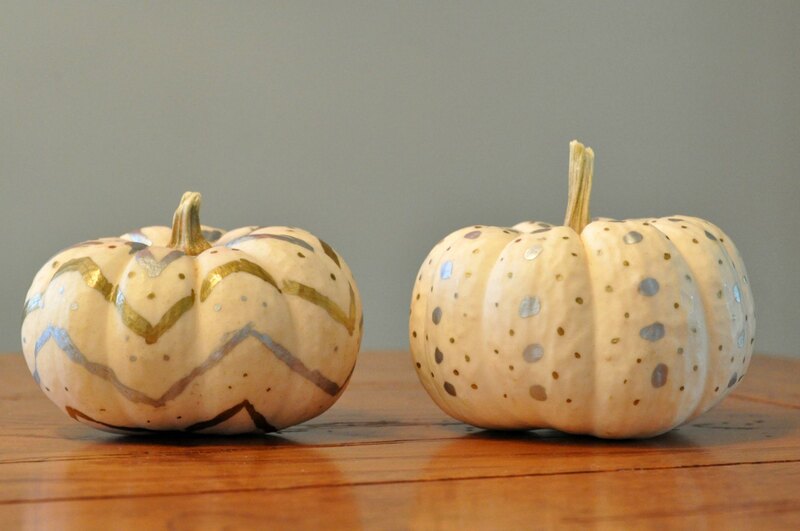 Let’s check out a bunch of pumpkin crafts from Sequin Crush. 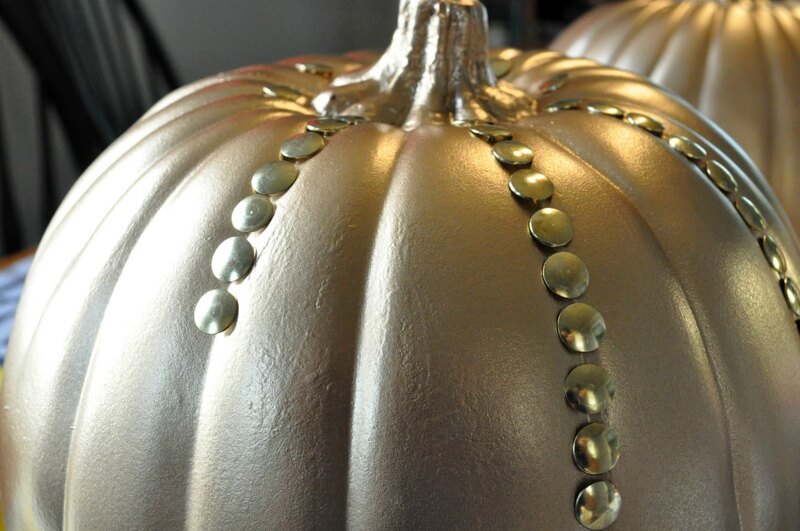 First up is a Studded Pumpkin. 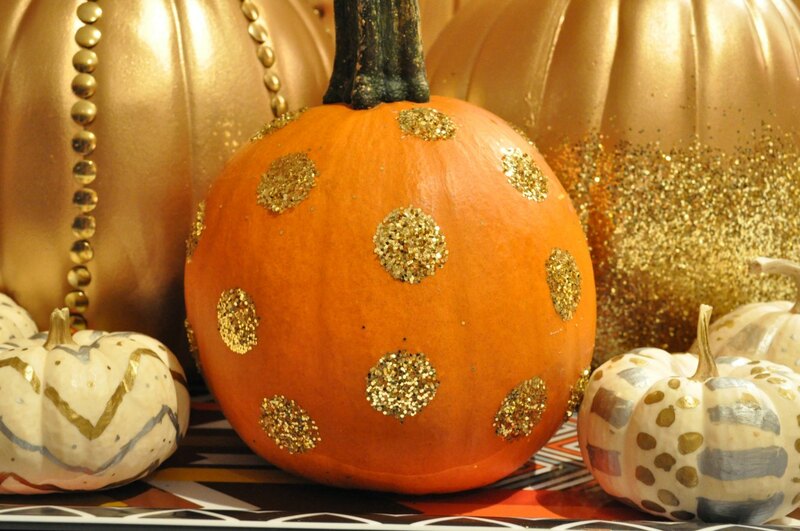 All you need to do is buy a foam pumpkin (I got mine at Michael’s but most craft stores carry them), gold spray paint, and gold thumbtacks. 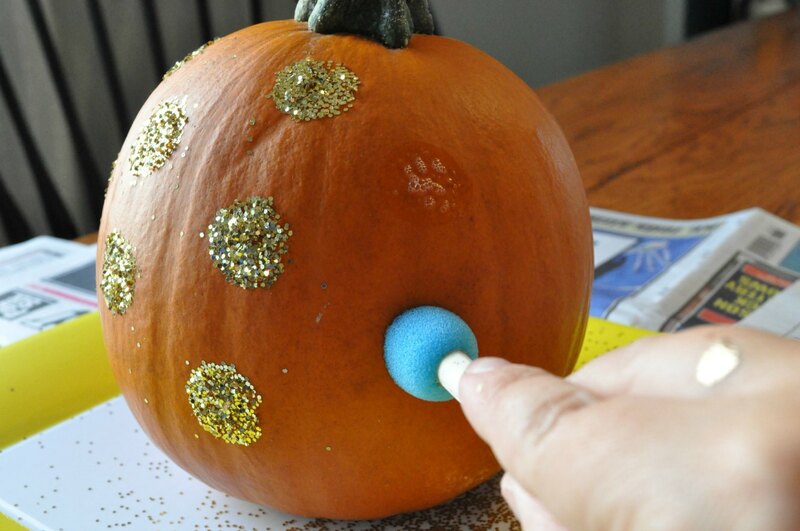 Once you’ve got your fake pumpkin painted (remember – never spray paint real pumpkins because you don’t want this to happen), just space out the thumbtacks around the top first and then just press into the creases. 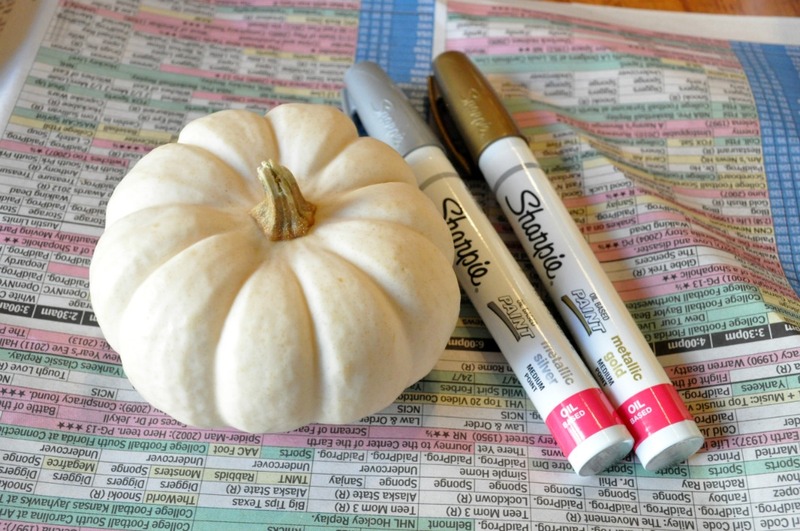 I needed about 200 thumbtacks for this large pumpkin. All done! And bonus: Because it’s just foam, you can save it for next year! 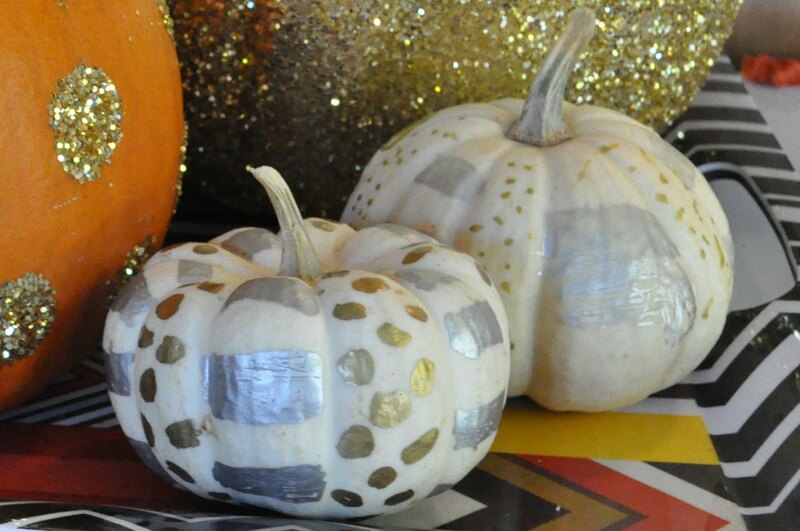 Next up is the Glitter “Dipped” Pumpkin. 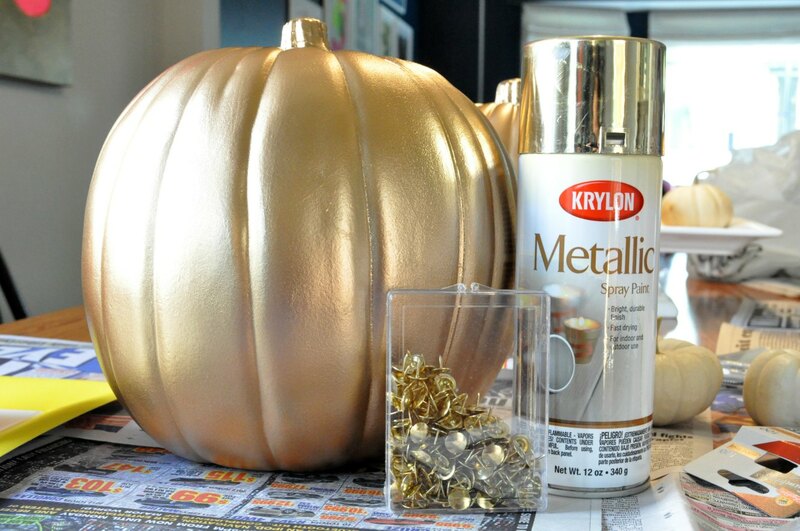 Again, start with a large foam pumpkin and spray paint it gold. 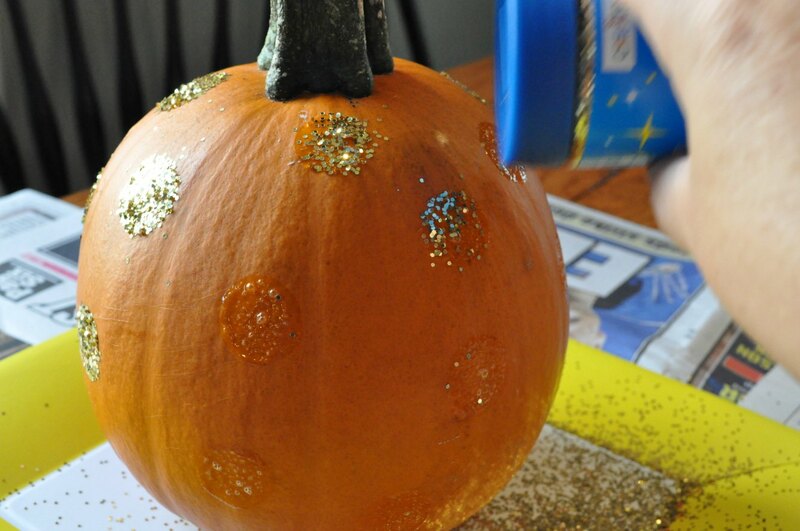 Then use a spray adhesive around the base of the pumpkin and sprinkle on the glitter as you go. 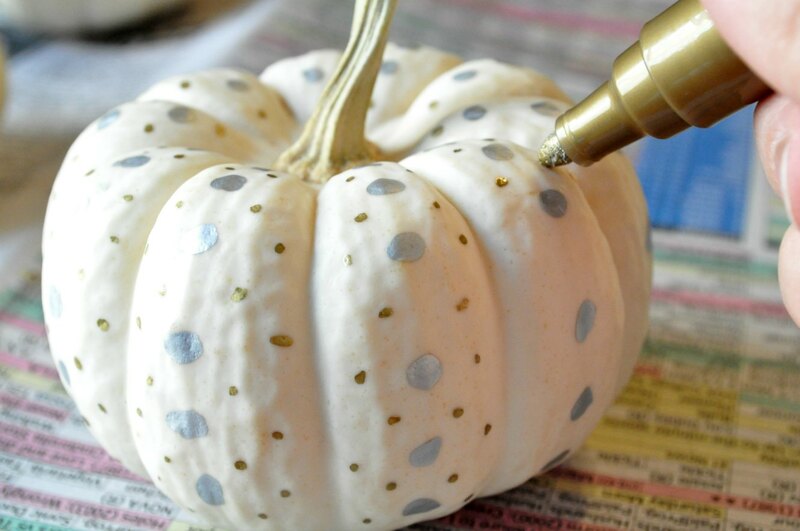 Spray a little, then glitter a little. Repeat until you’re all the way around. This baby has done quite a bit of shedding since I made it but I still think it’ll survive for a few more years. Next up was my favorite of all of the projects. It was insanely simple to do, it took about 2 minutes, and it came out great. 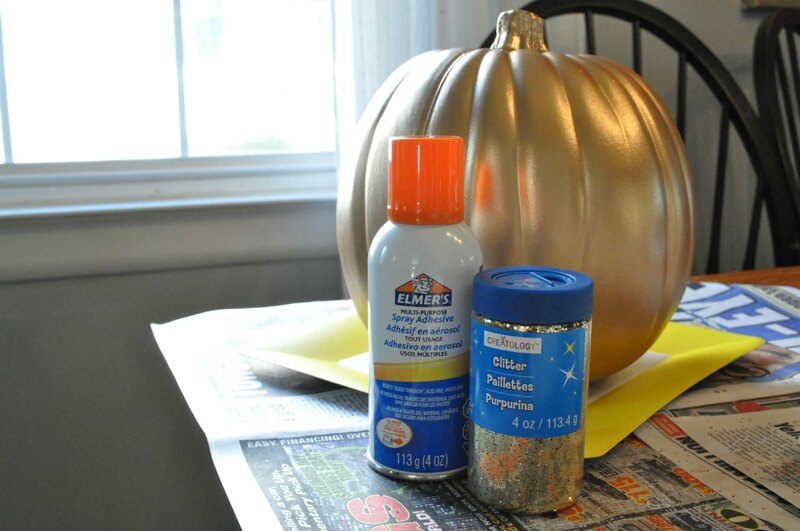 I started with one medium sized real pumpkin, clear glue, glitter, and a round foam paintbrush. 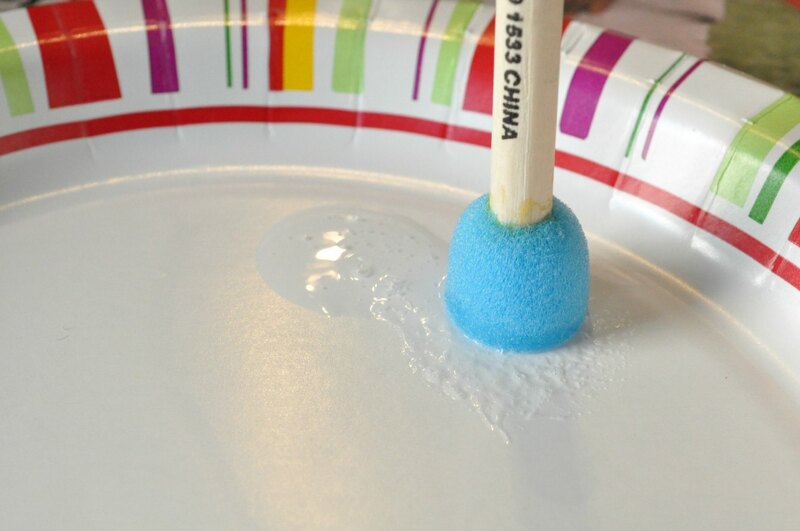 I put a little glue onto a paper plate and then dabbed the foam brush into the glue. Next, I sprinkled on some gold glitter and it was done. Sadly, this one won’t last beyond the season so I’ll just have to make another one next year. First, I followed Paper & Stitch’s design and found that it only took a couple minutes. Then I went rogue and created a chevron with dots pattern. When the girls saw what I had done, they wanted in on it too. So I gave Sophia the oil-based pens and she made the one in the front while Lily made the one in the back with the water-based pens. (I just figured that Five Year Old + Oil Based Paint Pen would not be a good idea.) As you can see, the water-based is fine but not as bold of a statement. 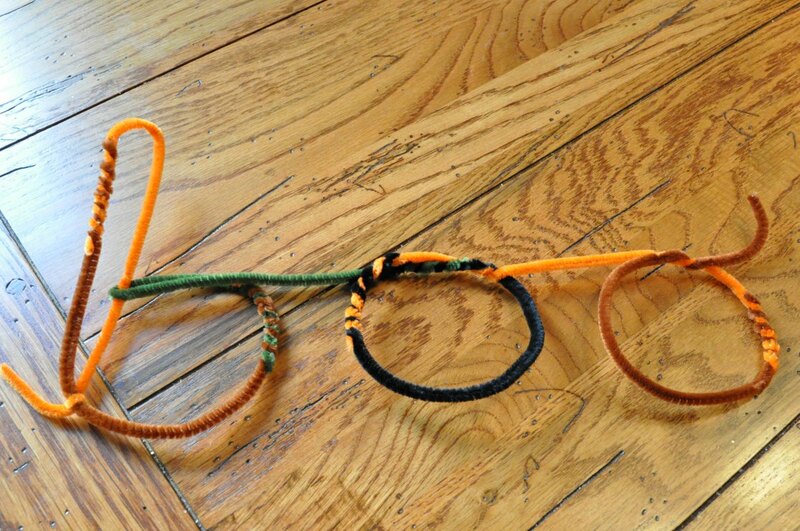 Next, I used pipe cleaners and yarn to make letters that were originally seen on the blog Cakies. This one didn’t come out as well as the others but–lucky you!–you can learn from my mistakes so you don’t make them too. Mistake #1 is pictured below. See how thick that orange yarn is? That’s how thick all of your yarn should be. I got sooo caught up with finding the right colors that I picked a bunch of way-too-thin yarns. Now listen closely because here comes mistake #2. 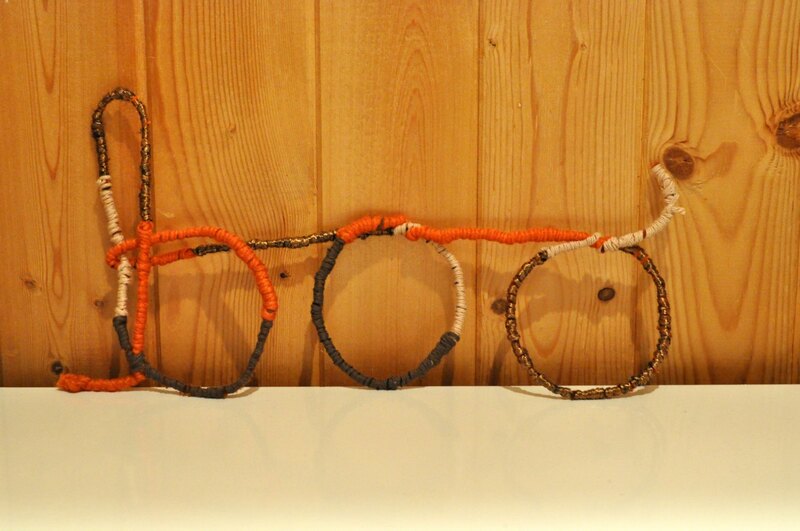 I started by twisting the pipe cleaners together and then bending them to make the word Boo. Please note: Don’t do that. Don’t shape it into the word before you wrap the yarn. It’ll make the wrapping take forever. 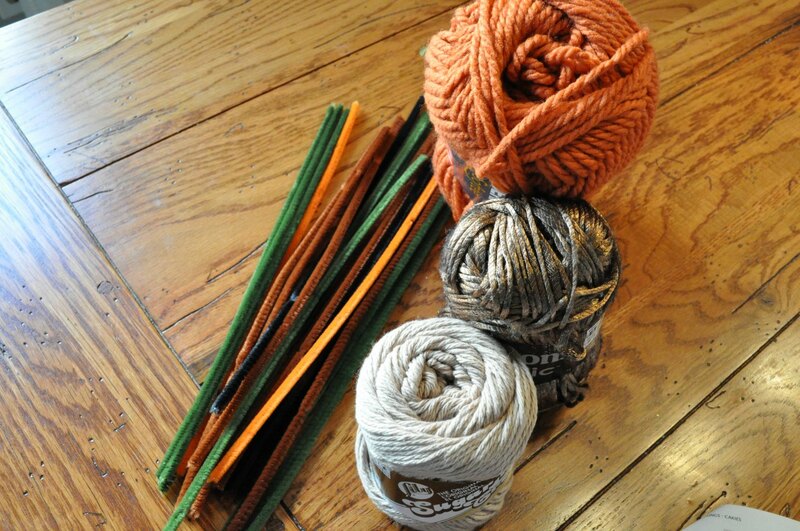 Just twist the pipe cleaners first but keep them in a straight line as you wrap the yarn. Ta da! Four hours later I had this. I know that sounds insane but as I told you, I screwed up. If you had thicker yarn and didn’t shape the word first, I’d guess that it wouldn’t take you more than an hour. I think the fun thing about this is that you could do any word with this method. “Ho Ho Ho” for Christmas? A kid’s name for a bedroom? “Eat” in the kitchen? Your last name on your mantel? The possibilities are endless. So, head on over to that DVR and figure out what time Better is on in your area tomorrow. You can click here and use that pull down menu on the top left that says Check Local Listings. Thanks for watching! Oh…and since the October issue of LHJ is off newsstands by now, you can visit lhj.com/halloween to see all these Halloween crafts (and a lot more!). But if it’s the real deal magazine you’re looking for, check out the November issue on newsstands now. You won’t be disappointed. Especially since Sophia and Lily are in the issue! That’s right! Our editor-in-chief asked us for a picture of something that makes us happy and she chose a bunch to feature on the editor’s letter page. Here they are seeing it in Barnes and Noble for the first time. 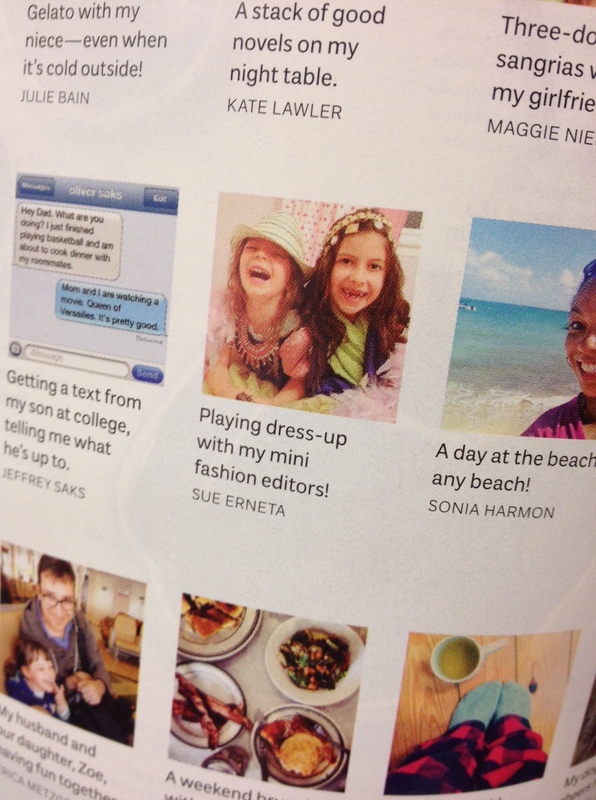 There’s nothing my narcissistic kids like more than looking at pictures of themselves! And a quick iPhone pic of the page. 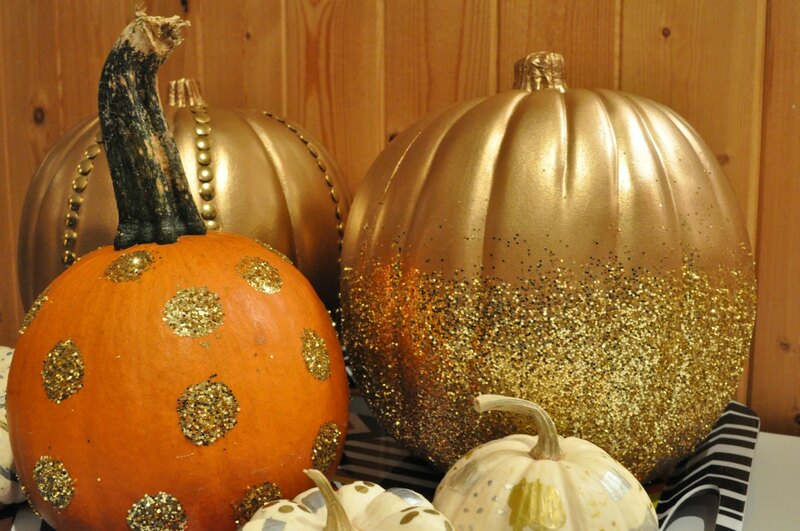 Love all these fun glittery pumpkins!